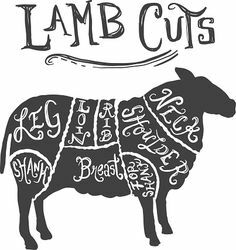 All our lamb and beef are born and raised here on our farm. Over the generations we have learned which families grow fat and happy on a diverse diet of grass, forbs, legumes and the odd weed. This environment spent in fresh air and sunshine ensures healthy animals that rarely, if ever, need antibiotics. We get asked a lot if we ship meat. The answer is no, we do not. We believe that good food is best enjoyed locally and that stopping at the farm where it was raised is part of the experience.